Many different cultures and faiths envelop beliefs that are not only applied to the individual’s walk of life, but to their beliefs about death as well. Losing someone you love is never easy, and these traditional practices are a beautiful, often comforting part of healing the healing process. They are also a way for family and friends to honor those who have passed on through carrying out the individual’s beliefs when they pass away. One such example of this is the funeral rites of the Catholic Church. Catholicism is centered on the Paschal Mystery, the core concept of Christian faith believing in the passion, death and resurrection of Jesus Christ. The Church believes that death is not the end, and has adapted guidelines for their funeral services. These guidelines, otherwise known as funeral rites, guide the Church in worshiping, praying for the deceased, and expressing honor and support to the family. The first funeral rite of the Catholic Church is called a Vigil, more commonly referred to as a “wake”. Wakes are typically held at the church or a funeral home, depending upon the traditions of the Diocese and parish. Wake services allow a time of viewing and visitation with the family and allow a formal reception of the body. A family member or relative may offer remarks to honor their lost loved one. The priest or deacon leading the wake will lead Scripture Readings and prayers. It is not uncommon to include music or a rosary at the wake service. Wake services are commonly held the evening before the Funeral Mass, but can also be held on the same day as the Funeral Mass at an earlier time. The Funeral Mass is a service structured just as other Masses. The Mass is a celebration of the death and resurrection of Christ and is held in the church. It focuses on Christ and his victory in death. The family and priest work together choosing music, readings and prayers for the Mass. Everyone in attendance is encouraged to participate in the Mass as much as Church rubrics allow. The priest or deacon will give the sermon or homily immediately following the Gospel Reading. The sermon or homily should focus on Jesus Christ as our Lord and Savior, His life, death, and resurrection and how the deceased tried his/her best to follow Christ’s example. It should not be a eulogy of the deceased. A friend or family member may be invited up after the reception of Holy Communion to give a eulogy, speaking in remembrance of the deceased. This also depends on the tradition of the Diocese and the parish. Music at Mass is usually traditional and may include a choir, organ or other instruments. A mass may be themed and music will reflect the theme. At the beginning of the Mass, the priest will bless the body by sprinkling holy water and draping a pall (white cloth) over the casket, this recalls our baptism into Christ’s death and resurrection and the pall symbolized that we are all equal in the site of God. The Funeral Mass follow the same order as a Sunday Mass with the Introductory Rite, Old and New Testament Readings, the Gospel, the homily or sermon, the Prayer of the Faithful, Offertory, the Consecration of bread and wine into the Body and Blood of Christ, the reception of Holy Communion, and the Final Commendations. Concluding the Mass is a procession to the place of committal, with the priest or deacon leading followed by the casket, family, and finally the other mourners. A Catholic burial service is called a Rite of Committal. Most often this is at a cemetery (final resting sites can also be at a columbarium or other reverential sites). It begins with an invitation, scripture reading, and prayers over the place of committal. This allows the church a final chance to care for the body and support the family in their loss and express faith in the resurrection of Christ. Often farewell songs may be sung. After the prayer of committal, the prayers switch to prayers of hope for those left behind to morn. This gives hope for the mourning in that those who have already passed on mark the way for those who have yet to meet God face to face. The Catholic Church did not allow cremation until recent years, and traditional burials are still preferred. 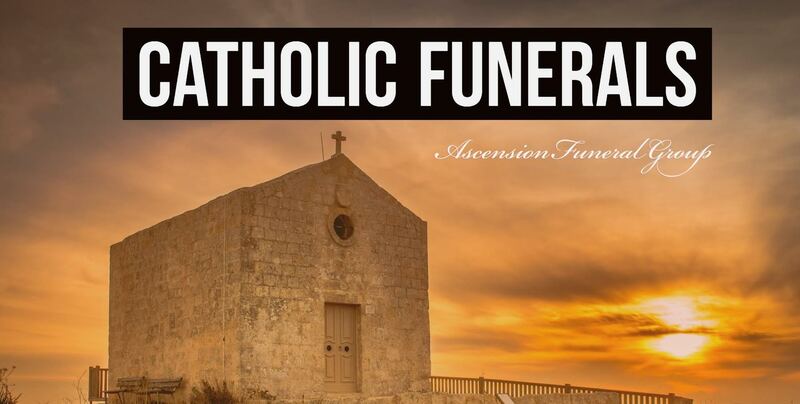 However, a Catholic person is now allowed to be cremated if he or she so desires, as long as the cremation of the body does not mean they no longer believe in the resurrection. The Church rubrics do require that in the case of cremation that the cremated remains be buried in a cemetery, place in a niche or mausoleum.